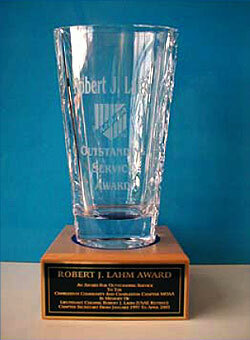 The Robert J. Lahm Award was established to honor the memory of Lieutenant Colonel Robert J. Lahm, who served as Chapter Secretary from January 1997 to April 2003. LTC Lahm made many significant contributions to both the community and to the chapter. The award recognizes the efforts of an individual to provide outstanding service to the Charleston Community and the Charleston Chapter, MOAA. Any Chapter member (including honorary) making a significant contribution to this chapter and/or the Charleston Trident Community is eligible. Any Chapter member may nominate a member of the Chapter for this award. This award has been given eight times in the past eleven years to well deserving members. It is presented to the winner at our November function. The recipient’s name is added to a permanent trophy, which is on display at the Charleston Air Force Base Club.